Home » DHR News » Posters – what’s the point? Posters – what’s the point? As we enter the final stages of the marriage equality referendum campaign, our lampposts (certainly in urban areas) are festooned with posters urging a yes or no vote. A variety of organisations, including all of the main political parties, have yes posters in place. There are a smaller number of organisations on the no side, but they have managed to compete in terms of numbers of posters. If it were a general election we were facing on this week, the postering would be even more intensive, with scarcely a meter of lamppost space available at this stage. Yet in Britain, where they had a crucial and fiercely fought general election earlier this month, there was hardly a lamppost poster to be seen during the course of the campaign. There were some posters in gardens and some in windows but nothing approaching the scale of postering we see in this country. “If it were not for the media, you would not have known there was a general election on,” one recent Irish visitor commented. No other country relies on postering to the extent that we do, and indeed many European countries place limits on the number of posters and where they may be placed, restricting them, for instance, to designated municipal hoardings. Why is it that we continue to poster on such a scale in Ireland and why is it that political parties and campaign organisations continue to rely on such a traditional form of electioneering, especially when there are so many more modern options available for communicating with the electorate? There are no easy answers to that question. As far as I am aware there is no research available that measures the effectiveness of posters, yet political parties continue to put great faith in them and, at election time, it is a very rare and very brave candidate who will totally opt out of the poster war. Of course the requirements of a poster for an election can be somewhat different than one for a referendum campaign. At elections the principal objective of the poster will be to get the candidates name across to the electorate and candidates of all parties wage war with their head offices to ensure that their names are bigger than anything else. Where parties want to promote a particular policy issue they usually use hoardings, either their own home-made ones or purchased space on poster sites or at bus stops or train stations. In a referendum campaign the aim of the poster is clearly to persuade the electorate to vote for or against the proposition. Having been involved over many years in referendum campaigns for and against constitutional amendments, it is my experience that designing a poster to encourage a no vote is simpler than designing one to promote a yes vote. In the current referendum campaign most of the political parties have gone for a fairly straightforward design and produced posters aimed principally at mobilising their own political supporters to come out and vote on polling day. Opponents of the amendment have produced posters that are generally more colourful, with stronger visual images and which contain claims that certainly their opponents would regard as controversial. 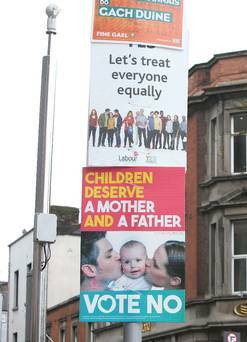 There is nothing new about opponents of an amendment producing controversial posters – those old enough will remember the ‘Hello divorce, goodbye daddy’ poster from the 1995 divorce referendum. Controversial posters will normally draw attacks from opponents, creating controversy and generating additional news coverage. Postering is an expensive business. The unit cost of a standard corrieboard poster is now about €4. At least corrieboard is durable. Up to the 1990s when everyone depended on cardboard posters, weeks of work could be wiped out by one wet and windy night. Corrieboard is also recyclable and most organisations do remove them with a view to using them again, but the ugly and dangerous plastic ties used with them remain an environmental problem. Some people certainly consider posters to be a waste of money and suggest they should be prohibited. 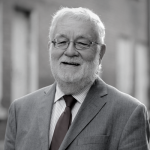 However, banning posters is unlikely to reduce expenditure at elections or referendums and any money saved in this way would simply be diverted into other forms of electioneering. Whatever about its long term future, postering is likely remain a feature of Irish elections and referendums for the foreseeable future. Although we are still almost twelve months out from an election I suspect that all Irish political parties will have already bought up their supplies of corrieboard for that contest. For those interested in the evolution of Irish election posters, the National Library of Ireland has a fine collection going back over many decades. In addition the Irish election literature website has a truly extensive collection of posters and leaflets available on line, ranging from the good to the bad to the scarcely believable.